4k will soon be standard go to resolution of all things in a few years. But in 2017 we are still tipping on it being the norm, just like 1080p and it’s predecessors. Those other formats took a while to become the norm and there is no real rush to go 4k besides ‘future proofing’. I personally still haven’t even switched to 1440p yet, and might skip it all together and go straight to 4k. Now there are some things to consider when going 4k and figuring out what graphics card you will need for 4k and that is determining what you are trying to do with 4k. Are you going to be using it for video viewing only? You will need some sort of 4k/ ultraHD display to get your money’s worth out of your purchase of a 4k graphics card. Typically 4k/ ultraHD monitors come in the resolution of 3840 x 2160 or 4096 x 2160 and this is 4 times the resolution of our current standard. If you are going to be dabbling in the 4k gaming world you will also want to have a good/ modern CPU that can handle the demand of 4K gaming. You can check out this video that the tech chap made giving you an overview of purchasing a monitor. So most modern motherboards with on board graphics have 4k capabilities, but are very limited to FPS. This means things can get kind of choppy and on board graphics is just not really ideal at all. So for 4k video viewing i’d recommend a nice low end card like an RX 460 or a GTX 1050. After you purchase one of these card and notice any choppy streaming this could be an issue that is the fault of your bandwidth. As you can imagine 4k streaming can be demanding and you might have to upgrade to stream 4k efficiently. So don’t blame the card. For 4k gaming we can go on a budget or spend a good amount of money. 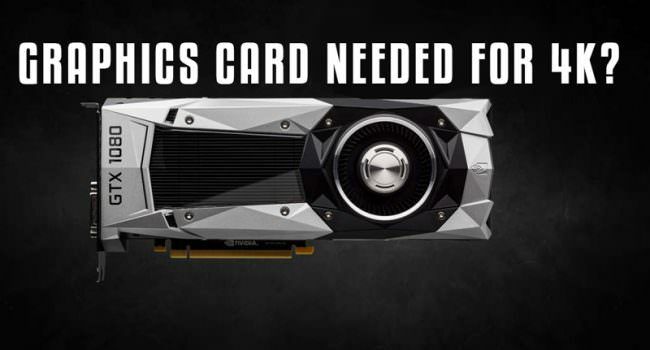 Spending more money on a graphics card for 4k gaming will get you a better user experience. Yes, you can 4k game on a GTX 1060 or RX 460. Is it ideal? no, not really but you can definetly tease yourself with 4k on low/ medium settings. Depending on the game (the game is very important and varies results) you can even achieve 60 FPS at 4k. Albeit the games that can get 60 FPS at 4k will more than likely be less demanding. If you don’t want to worry about fidgeting with graphics settings for every game then set your sights on purchasing a GTX 1080 or RX 480. I’m not going to tell you to go AMD or Nvidia, as that can come down do fanboying and a whole crazy debate. 4k video editing can be done a budget Should you do it on a budget? Yeah why not, as long as you know what you are getting yourself into. You won’t be able to preview the video at full preview once the video starts getting demanding. If that doesn’t bug you then sure you can get away with a single GTX 1060 or RX480. If you have the money though I would definitely go with the GTX 1080 along with a quality CPU (i7 7700 or AMD), this can basically double as a gaming PC if need be. Are Graphics Card brands important? Yes and No. By this I mean that I have had success running lesser name brands without a problem. Online you will here about horror stories about customer service and products being faulty. This is accurate to an extent. You also have to remember that angry customers voices are much more louder online. So don’t let those angry reviews weigh to heavily on your chance to save money (if saving is an end goal). Now bigger brands do usually have way better customer service, and higher quality builds, which is why you see that difference in cost. But like any type of technology there is a chance that you will lose the silicon lottery and get one of the duds or something that doesn’t perform as well. It just happens, the product does pass a level of quality assurance, just sometimes human error occurs.